Lucas was diagnosed with Leukemia at the young age of 7 months old. He was treated at UCLA Mattel Children's Hospital over the course of a year. It was a very difficult year for us as a family. But thanks to the wonderful team of doctors, nurses and staff Lucas is in remission and thriving! Lucas is in 4th grade and an excellent student. He has made Principal’s List at school and loves to read. 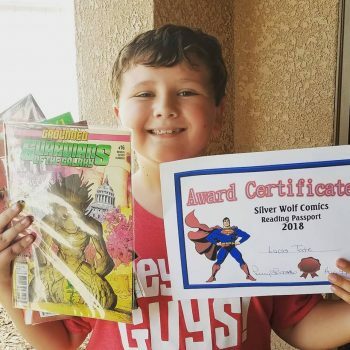 He is very creative and enjoys making videos, writing comics, building Legos, and playing Minecraft. He also enjoys spending time with his family going on camping trips, riding roller coasters at Magic Mountain and going on “adventures.” He looks up to his big brother Bradley, loves to swim, ride horses and inspires us daily with his courageous spirit and love of life. Lucus is a proud Dribble for the Cure captain.